The Broom Corn Seed Funeral Swindle. 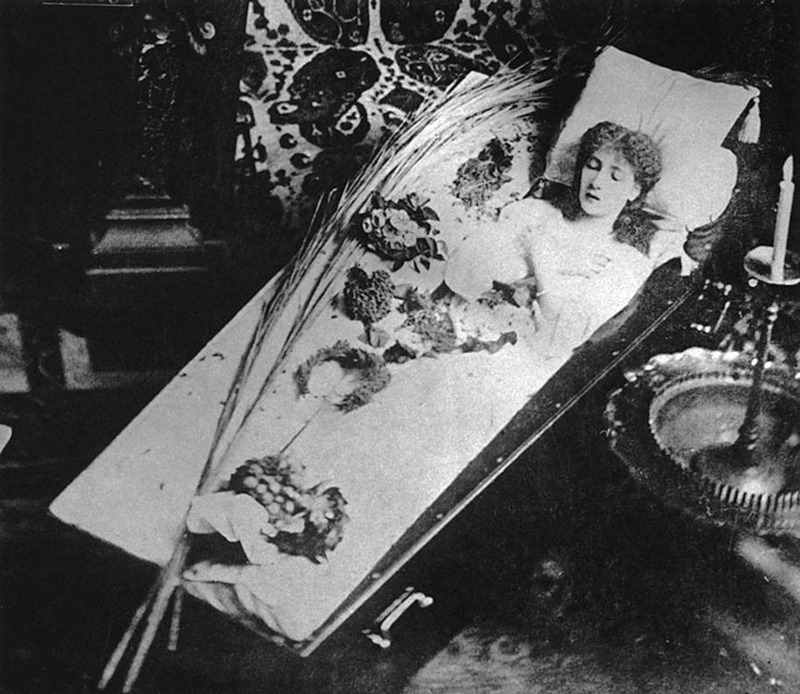 Sarah Bernhardt shamming death in her coffin. Who among us has not fantasized wistfully about faking their own death and disappearing? Hands? Obviously the art of disguise figures heavily in faking death. Mrs Daffodil posted recently on a Victorian urban legend about a funerary scam in which the “corpse” was nicely painted to simulate death’s pallor. The peerless master in this next story, however, not only impersonated the corpse, but his own widow, leaving us gasping at the audacity and applauding his self-reliance. Well, he was brilliant up to that last bit. It is disheartening that someone who had taken such pains was, in the end, so careless. Why, if you wanted to appear to be dead, wouldn’t you stay the hell away from places you are known? A disappointing lapse in an otherwise flawless plan. As the Bloomberg article on faking your own death suggested, the scheme might be more appealing than bankruptcy to those with a large amount of debt. BRINGING A ‘CORPSE’ TO LIFE. Life insurance was the more usual motive in these cases. I suspect that this is the story that inspired the plot of The Thin Man. Ah, there’s the snag: procuring that all-important body for insurance purposes. In the old days, you could probably just pick up a plausible-looking corpse lying around in graveyard, back alley, or medical college, but the end of bodysnatching meant that murder was the only option. Of course, if you were actually fond of the soon-to-be-corpse, there was always that old standby: bricks in the coffin. Audacious Attempt to Defraud an Insurance Company. Here we see again the importance of the Incompetent Physician, a pivotal figure in domestic poisonings or pseudocides. In this next case, how different things would have been if Dr. Bassett’s wife could have recognized his extra-domestic interests without annoyance. A New Way to Get Rid of a Wife. We announced on Saturday, that Dr. Bassett was drowned from the Southerner, on her way from Cleveland to Detroit. It now seems there is a little romance in the story, and Dr. Bassett is still alive and kicking. A gentleman came on board of the Southerner, and purchased a ticket for himself, calling his name Morse. The clerk gave him a state room and told him he should be compelled to put another man in the room with him. All satisfactory. Mr. Morse was very indifferently dressed. In a very short time, a person very genteelly dressed called for a ticket under the name of Dr. Bassett. The clerk gave him a berth in the state room with Mr. Morse. In the passage up, the story was started by Morse, that Dr. Bassett had fell overboard, while in the act of vomiting. All credited it. After a few moments, the Captain came to the conclusion, that it was singular that no other person than Mr. Morse saw the accident, and some surmised foul play. Dr. Bassett’s baggage was looked for in his room, but nothing but an old russet leather valise, with his name on it, could be found. This appeared rather singular for so genteel a traveller, who at least would require a change of linen. Thus matters remained until after the boat’s arrival at our wharf, and Mrs. Bassett was telegraphed that she was a widow. On reviewing the whole circumstances, it was concluded that Mr. Morse ought to be arrested and an investigation had. Accordingly, a warrant was obtained and an officer took charge of him. Mr. Morse and Dr. Bassett, from the story of the prisoner, are one and the same man, and the unfortunate plot was a stratagem to rid himself of his wife at the east. He tells the story thus: When he got the ticket, he wore an old suit. As soon as he got the key of his state room, he entered at once, and placed upon his person another suit of clothes and a pair of false whiskers and went to the clerk for another ticket, as Dr. Bassett, which he says is his real name. The drowning scene was got up for the eastern market, where he has a wife, and desires it for home consumption. If you were Mrs. Bassett, called upon to identify the scoundrel, what would you do? I suppose it would have depended on whether she was the beneficiary of any will or life insurance policies. Mayor of Eaton the Dead Man. Attempt to Realize $20,000 on Life Insurance. Arrest of all the Parties to the Fraud. All the facts and incidents connected with the reported sudden death of a man near Lebanon, Ohio, and his hasty burial at Eaton, seem to have came to light, and we present them below in detail. The whole affair reveals a long premeditated plot of fraud, on the part of heretofore respectable citizens of both Eaton and the vicinity of Lebanon; and although the parties implicated may not be convicted of crime, their criminal intentions seem very strikingly manifest, and no one will envy them the reputation they have made for themselves in this matter. On Monday, the 24th, a man, who gave his name as W.T. McFadden, rode out from Cincinnati in the omnibus driven by Abner L. Ross, and got out at Frank Richardson’s near Lebanon, having complained of being sick on the way out. In the evening Frank Richardson went into Lebanon, reported that McFadden had died of cholera within twenty minutes after stopping at his house, telegraphed Mary McFadden, care of B.M. Batchelder, Eaton, that her husband was dead, and bought a coffin which he took home with him. The undertaker wished to go with him and encoffin the corpse, but his services were persistently declined. It has been ascertained also that Mr. Richardson purchased some chloride of lime and peppermint drops, when he was town after the coffin, the use of which will appear in the sequel. On Tuesday morning, when everybody was supposed to be absorbed in Christmas festivities, Mr. Richardson called in a few neighbors, as they supposed, to lay out the corpse, but they found the coffin closed and they were only asked to help lift it into a spring wagon. On asking to see the corpse, their attention was directed to the offensive smell coming from the coffin, and warned of the danger of catching the cholera, and the lid was not removed. Dr. N.S. Richardson, brother of Frank Richardson, formerly surgeon of the 12th Ohio cavalry and a practicing physician of Eaton, was the only person present during the reported death of McFadden. In reference to his part in the affair, it is said that on Monday he left Eaton with the declared intention of meeting McFadden at Lebanon, to close a contract for the sale to him of a tract of land in the West. On Tuesday Dr. Richardson returned to Eaton, and stated that he met McFadden according to agreement, but that immediately after his arrival upon an omnibus at Frank Richardson’s, he was taken violently ill with an attack of cholera and died. Dr. Richardson then engaged an undertaker to go to Lebanon with a horse, to bring the coffin containing the remains to Eaton for interment. He also visited a clergyman, and requested him to hold a brief burial service at the Methodist Episcopal church in the evening, which, owing to other engagements, the minister was unable to perform. The undertaker started for Lebanon, and when four miles beyond Middletown met Frank Richardson with the coffin said to contain the corpse, in a spring wagon. The coffin was transferred to the hearse, which was driven rapidly to Eaton, B.M. Batchelder, who accompanied the undertaker, urging him to apply the whip. The coffin arrived in the evening, about 6 o’clock and Dr. Richardson, securing the assistance of three or four citizens, had the supposed remains conveyed immediately to the burial ground and interred. A woman personating Mrs. McFadden was present when the corpse arrived, and was loud in her passionate cries to see her dead husband, but the stench from the coffin and the danger of contagion were urged upon her, and the gratification of her wishes was denied. On account of the suddenness of the reported death, and the secrecy with which the corpse was encoffined and removed, suspicion was aroused in the minds of the citizens of Lebanon that there was something wrong in the affair. They telegraphed to parties in Eaton, and officer Wampler and an assistant started over to Eaton, with warrants to arrest Dr. Richardson and Batchelder. They arrived about midnight, and learning the circumstances of the interment, their suspicions were strengthened, and they made the arrests. Early on Wednesday morning the undertaker was sent to disinter the remains. Upon opening the grave, it was found that other parties had preceded them; the coffin had been broken open and its contents removed during the night. Here was more mystery, which was not solved till Dr. Richardson, seeing the plot would all come to light sooner or later, made a confession the same day, to the Prosecuting Attorney, that McFadden held a life insurance policy in favor of his wife for $20,000, that Batchelder, who is an agent for a life insurance company, McFadden and himself had entered into a plot to publish McFadden’s death, while McFadden should secrete himself, and thus secure the $20,000, which was to be divided among them, that the coffin contained broom corn seed, [cheaper than bricks?] which they had removed after the interment, so that, should the insurance company institute a search, this evidence of their guilt would not exist. The story was confirmed by finding the broom corn seed where Dr. Richardson said he deposited it. Where was McFadden? The statements of Dr. Richardson and Batchelder in regard to his whereabouts were not satisfactory. But during the day Mr. Ross, who drove the omnibus in which McFadden rode to Lebanon, arrived in Eaton, and in one of the little crowds he met about town, talking over the strange affair, he espied the missing McFadden, and who should he prove to be but his Honor the Mayor of Eaton, Mr. [Luther C.] Abbott. When charged by Mr. Ross with being his late sick passenger, he stoutly denied it, but on being taken into the presence of Dr. Richardson he had to give up. Whether he has been arrested or not we do not know. Frank Richardson, however, was arrested, and in the same spring wagon in which he drove away the full coffin, he was compelled on Thursday to ride back with the empty coffin, beside an officer. As the wagon was driven along the streets of Lebanon an immense crowd, mostly of boys, followed, crying out, “Where’s your broom-corn seed?” “What’s the price of broom-corn seed?” He and his brother; the doctor, and Batchelder, are now lying in the jail at Lebanon, waiting further developments. It appears that policies for $20,000 insurance in the Mutual Benefit Life Insurance Company of Brooklyn, of which B.M. Batchelder, of Eaton, was agent for that place were taken for W. T. McFadden, who seems to have been a fictitious personage. A policy for $5,000 was taken in the same interest in the Mutual Benefit in Dayton of which Mr. I.H. Kiersted is agent, and $5,000 in the Connecticut Mutual, of which Dr. Jewett is agent. We understand that Frank Richardson disclaims any participation in the plot, until after the enacted death in his house, but the fact that the family were all opportunely absent on that interesting occasion; that he had borrowed the spring wagon; and had it there in readiness before McFadden arrived, and had also borrowed sacks to hold the broom-corn seed, seem to indicate special preparations for the part he was to perform. Top tip: The fewer people involved in your insurance fraud, the better. And what inspired the Mayor of the county seat of Preble County, who was also a lawyer and former Prosecuting Attorney, to participate in such a plot? Bad business investments? Tapping the public till? Eaton was a rather unlucky little town, decimated first by cholera in 1849 and by a massive fire in 1859. Perhaps Mayor Abbott did not have fire insurance. I am at a loss to understand how he escaped arrest and prosecution; he was re-elected Mayor (to much adulation in the local papers) and was still practicing law in Eaton in the 1870s. Undine of Strange Company shares two brilliant cases of insurance fraud: The Wrath of Walburga and Give the Howards a Hand! Thanks, Undine—your posts are always a jaw-dropping pleasure!